Siemens is cutting 6,900 jobs, mostly in Germany and U.S.
Siemens employs more than 370,000 people around the world. Industrial conglomerate Siemens is planning to cut 6,900 jobs, mostly in Germany and the U.S. 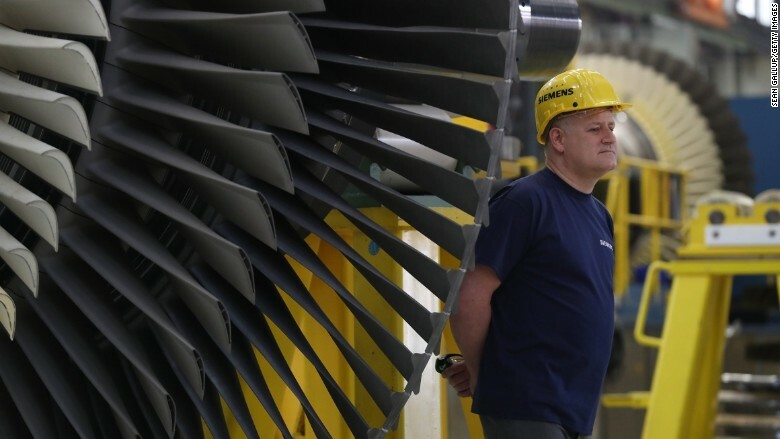 Most of the job cuts will hit the Siemens (SIEGY) unit that provides turbines and services to companies that generate power from oil and gas. The German company said Thursday that the cuts were necessary because it faces increased competition from the renewable power market. "The power generation industry is experiencing disruption of unprecedented scope and speed," explained Lisa Davis, a Siemens board member. "Renewables are putting other forms of power generation under increasing pressure." Another Siemens division that provides large electrical motors and generators to miners, steel producers and shipbuilders will also shed some jobs. The job cuts amount to nearly 2% of Siemens' global workforce of more than 370,000. About half of them will fall in Germany, where some locations will close. In the U.S., 1,800 jobs will be lost through the consolidation of production facilities and administrative functions. Siemens said it's hoping to move quickly to slim down these businesses. However, speed isn't guaranteed. "Given the structure of the businesses that are affected, it might take years to implement the restructuring," spokesperson Robin Zimmermann told CNNMoney. The company said it currently has 3,200 open positions and it hopes to transfer affected workers into these jobs whenever possible. The job cut announcement comes in the same month that a Siemens-controlled business in Spain -- Siemens Gamesa -- announced it would cut 6,000 jobs, or about 22% of its workforce. This renewable energy business sells wind turbines globally. It said the job cuts would be spread across 24 countries.